Article on Rahul Banerjee (Bandopadhyay) Archer Profile / Biodata / Biography, Family Birth Day Educational life of Rahul Banerjee Gold Medalist Archer, Contact Address Location of Archery World Cup Gold Wining team member Rahul Banerjee (Bandopadhyay), Career Awards Achievements Coach details of great archery sportsman Rahul Banerjee (Bandopadhyay). Rahul Banerjee, Indian sportsman, has represented India in Archery World Cup and is the member of Archery World Cup India Team that won Gold Medal. Sister name of Rahul Bandopadhyay : Dola Bandopadhyay (Banerjee) who is also an established and famous Archer from Kolkata who have won 2-Golds in Personal rounds in Archery World Cup. 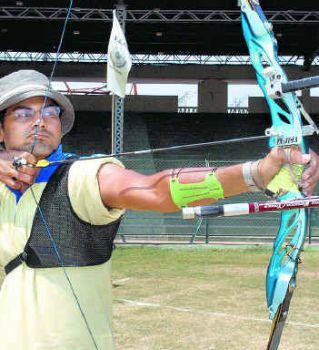 Kolkata's proud Rahul Banerjee (Bandopadhyay) had started his journey in Archery at the age of thirteen and the first international appearance of Rahul Banerjee was in Youth World Championship in the year 2004.